I call this episode a "breather" -- a more calm, slowly paced story arch, after what felt like weeks of being punched in the face (beautifully punched, I might add) with reveal after reveal. It was not a strong story, but an important one, though I was not expecting them to get back to the island so quickly. Eloise take Ben, Jack, Kate, Sun and Desmond to the basement of the church, into what she calls "The Lamp Post" (reference to Narnia perhaps?). Here we see a Foucault pendulum, a map, boards with calculations and old computers. DHARMA figured out there was an island, but not where or when the island was. One man (Widmore? Daniel?) discovered a means find the island. Eloise tells them they all must board Flight 316 to Guam; recreating their original flight as best they can. 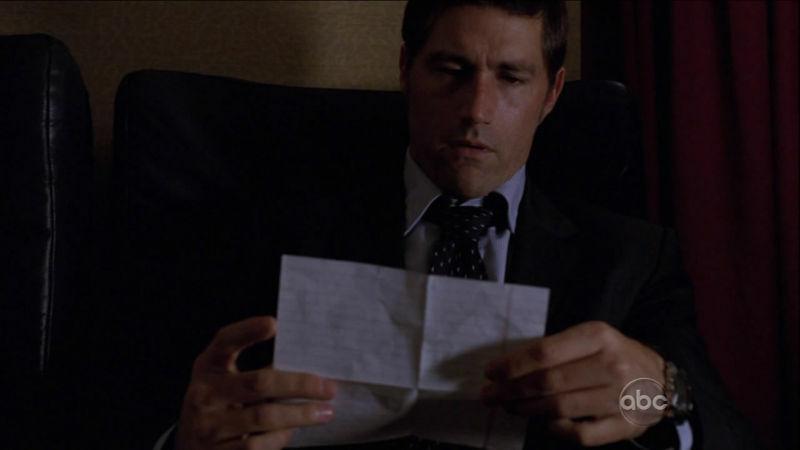 Eloise pulls Jack aside and gives him a note that John has left for him. She also says he needs to bring John's body as proxy for Christian. Jack goes to Ray, his grandfather, and gets a paif of his dad's shoes (which his grandfather inexpliciably has). Sayid, Sun, Hurley, Kate and Jack all arrive at the airpot, board Flight 316 and await their fate. Frank is the pilot. Poor guy. Instead of crashing, they all get "absorbed" by the the flashing light of time and reappear on the island in various places. A DHARMA van arrives at the scene whre Hurley, Kate and Jack stand in the water and a gun points at them -- it's Jin! What happened to Ben, who beat him up? Why does Kate look so so terrible? Did she give Aaron to Ben, but torture him? Try to kill him? Where is Aaron, and why doesn't he have to go back to the island? What is Christian Shepards role in all of this? Who discovered the "formula" to find the island? Who is Eloise, why does she know so much? Why didn't see have any response to Desmond telling her about Daniel's message? The Temple, what happens inside the temple to brainwash people? And what exactly is the Black Smoke monster? Why is Jin in a DHARMA suit? Just clothes he found? Have they not jumped for a long long time? I could probably go on asking question after question for another half hour, but I'll stop. What is on your mind? Anything I miss? And if you don't understand my Time Bandits reference, watch it; its pretty great. Comments for "Recap: LOST (S5,E6)"
Ben got beaten up by Desmond and/or Penny. He said something about needing to tie up a loose end and fulfill a promise, which I took to mean "oh, I promised Widmore I'd kill his daughter because he was responsible for the death of mine and now I know she's close 'cause I just saw Desmond." Also, I wish someone would kill Kate. I'd probably put real money in for an organized hit of some variety. Hmm, interesting. That would mean if Ben is still alive that Desmond or Penny is ... not? You can't trust Ben, that seems clear (even Eloise and Christian alluded to that). I'm not sure that Aaron disappearing and Ben have anything to do with each other except that Ben was maybe trying to manipulate Kate's fear of losing Aaron to get her to come back to the island. Could Aaron be heading to Sun's place? Didn't she tell her daughter that she was bringing a friend for her to play with when she was on the phone, in the car, watching the Ben/Jack/Sayid/Kate interaction at the pier? I'm pretty sure Sayid went to jail because of the men he killed; I believe Hurley was released (I think that lawyer Ben hired helped him out). What about Sun's kid? They never mention her -- did Sun just leave her with her dad or something? I'll have to go back and watch, I don't remember that Kate phone conversation at all. I hope Kate gave Aaron to Desmond (who I find to be a Moses like character, he does the work but never reaches the promised land). Prediction: Desmond gets shipwrecked on the island. He'll accidentally hit a window. Everyone keeps referring to Desmond as special. He could see Charlie's future, I wonder the full range of his abilities are. I also think Widmore likes Desmond, he just knows his destiny. As you may tell, I really like the Desmond character. He is the constant. I don't like Kate or Jack. They both are annoying, Why they never have a real conversation is beyond me. You'd think that after secret after secret you'd be compelled to be on the same page. Those two characters were my biggest challenge in getting into Lost. The only thing saving Kate is that she's cute as a button and it makes Sawyer funny. I heard on the producer's podcast that the next episode (about what happens to Locke when he comes back) was originally supposed to come before this one, but they decided it worked better this way. So, some of the bigger WTFs (like Sayid in shackles) will probably make more sense (not that Lost is worried about things making a whole lot of sense right away). It seemed like everyone on the plane was sort of doing their part to make it as Oceanic 815ish as possible, e.g. Hurley w/ the guitar (like Charlie), and Sayid in chains (like Kate) and of course Locke-in-a-coffin (like Christian Shepherd). I bet Kate is pregnant too, as a proxy for Claire or Sun. See, now I was thinking that maybe Hurley ate a baby as a proxy for Sun and Claire, but Kate being pregnant might make more sense (and thus all her haggard look, because it's probably Ben's baby). Re: Jin in the Dharma suit - my guess is when Locke jiggled the wheel back onto its axis, it stopped "skipping" and making the island jump through time. Unfortunately the time it stopped on is in the "past" - Dharma-era. The Losties are now stuck in that time and are assimilating into Dharma for one reason or another - hence Charlotte interacting with Daniel as a small girl, Daniel's presence when they were building the Orchid station, etc. Also makes me wonder if Juliet interacts with a young Ben, explaining Harper's comment long ago that Juliet looks just like "her." Was it just me, or did this episode seem overtly "Christian" in its spirituality? There was some hints of that -- sacrifice and faith (mostly with Locke). I'd its more "spiritual" or even "supernatural" that Christian in the themes. Comments are turned off for "Recap: LOST (S5,E6)"